Spring is here! The last couple months have been slammed busy with calendars full. Blessed are those that got on my calendar early enough because plenty got turned away. 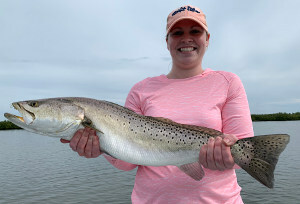 Want to fish in April…I just had three cancellations, and have one other open day, otherwise the month is already full. So don’t wait! Grab the phone, text, email, get it reserved!!! And thinking about May or June, better don’t delay because each is already over half booked. So what are we catching??? Everything! 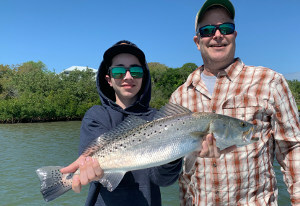 Nearly every trip during the last few weeks has succeeded in boating an inshore grand slam…redfish, speckled trout and snook. Some days we replaced one of those species with a flounder or black drum. But it’s been a lot of quality catching on a daily basis. 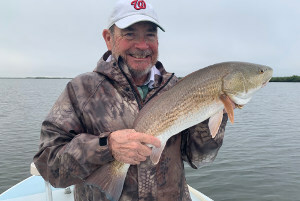 The annual spring bait run is about to really peak in the next few weeks so the bite is only going to get better. 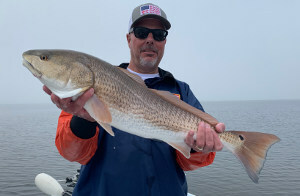 Redfish in Mosquito Lagoon have been pretty consistent for the last couple months. Winter schools have quickly broken up with higher water levels and warmer water. 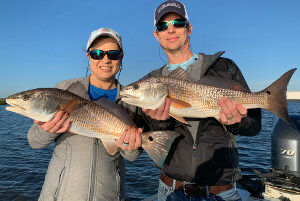 Redfish can be caught using lures like spoons, soft plastics and plugs, as well as on live shrimp and cut bait or live mullet. 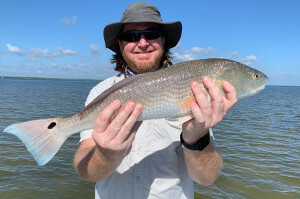 Mosquito Lagoon redfish have been tailing well lately on grass flats which makes for great sight fishing. 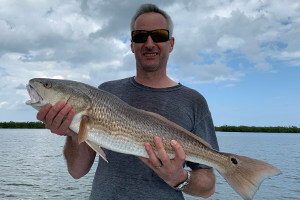 Redfish closer to Ponce Inlet and New Smyrna can be caught fishing lures and live baits around the jetty, bridges and docks. 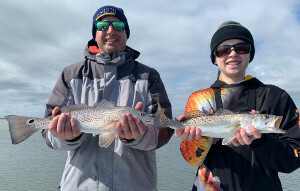 Regardless of where you fish for them, most fish are in the 4-6 pound range. 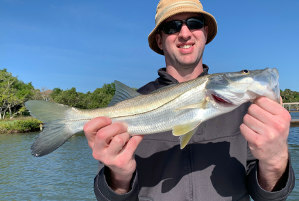 Fishing for Snook in New Smyrna Beach has been really good as the water has warmed up. 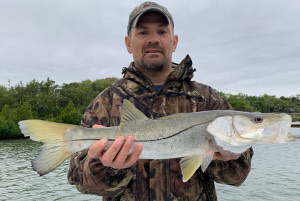 Snook are still staying relatively shallow and when you find one there are usually a bunch more there with it. 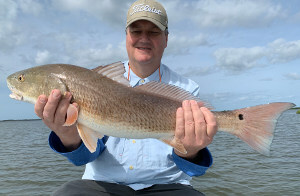 Tides have determined the best bite, which each flow producing good action. 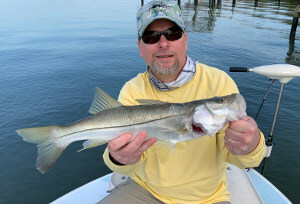 Snook have ranged in size from 12-28 inches and are being caught on live shrimp, soft plastics, and plugs. 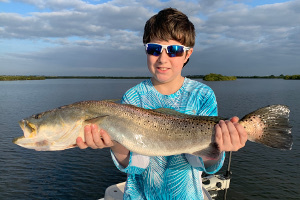 Fishing for speckled trout in Mosquito Lagoon or the New Smyrna Beach backwaters has been on and off again. Somewhat typical for this time of year. 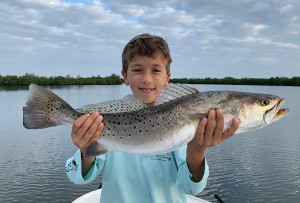 There are some areas in Mosquito Lagoon holding some very large gator trout approaching 10 pounds. Getting the bait to catch them has been extremely difficult which leaves casting lures. And well, getting them to eat a lure is no easy task. When we’ve got the bait, we’ve caught some big ones. Good news, all this changes in about 3-4 weeks when the trout catching bonanza will commence because spring bait will be here. Then it’ll be back to 20-30 trout per day. 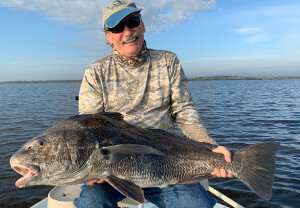 There are some schools of black drum around which provide a good change of pace. We can catch them using live shrimp or crab chunks. 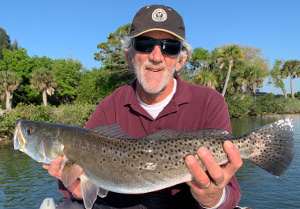 We are also catching some of them around the bridges and docks near Ponce Inlet and New Smyrna Beach on live shrimp. There’s also been an uptick in flounder coming to the boat. Somewhat unusual for time of year, I haven’t been catching any all year, but a couple days found us getting a few. So you never know.